Zariel is on a mission from God – specifically the god Paladium, the warrior deity of Holy Justice who abides in blessed Elysium. In Elysium too, Zariel resided, a saintly soldier in Paladium’s perfect celestial army that stands ready to fight the demon hordes that will one day be released from Gehenna. Ages ago, Elysium was visited by the leader of another pantheon – Odin the All-Father. The Viking God was impressed by Paladium’s mighty host- and jealous. Returning to Asgard, Odin sent out his valkyries to raise his own army for the end-times. Naturally, Paladium scoffed – no boorish viking horde could ever match his most excellent and holy host. But recently, Paladium has heard rumors that the valkyries’ intense rivalry to bring back the best warriors has borne fruit. And he’s heard whispers that through the chaos and nonsense of the Grand Tournament of Valhalla, Odin’s ragtag army of the afterlife has forged itself into a formidable force. Paladium has sent Zariel to investigate. In Valhalla, Zariel entered the tournament to take measure of this motley crew. 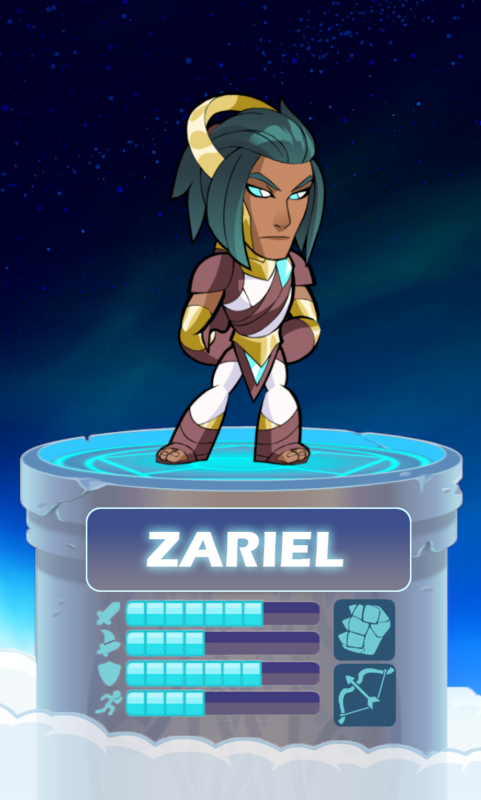 However, the battles of the Grand Tournament hold an allure for any warrior, and Zariel’s emotionless participation is starting to give way to fun.